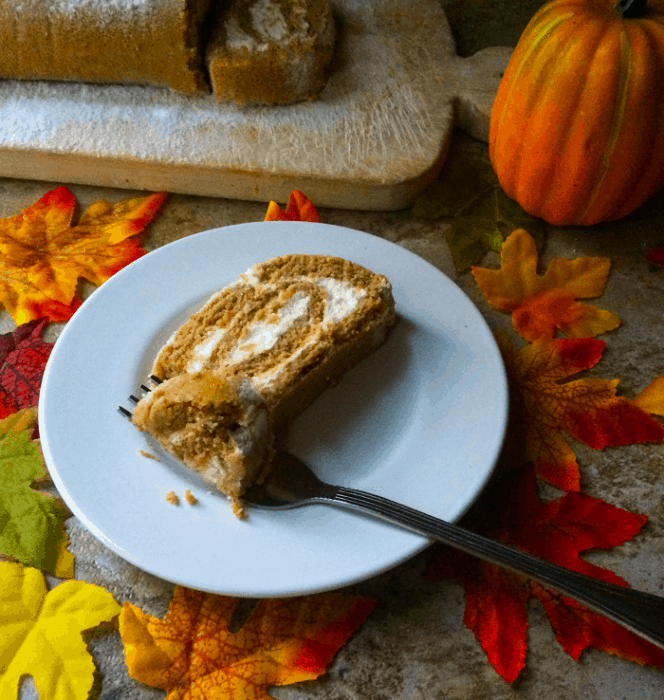 I created this keto pumpkin swiss roll or roulade (just a fancier way of saying roll) because it is one of those desserts that is so good and looks great. 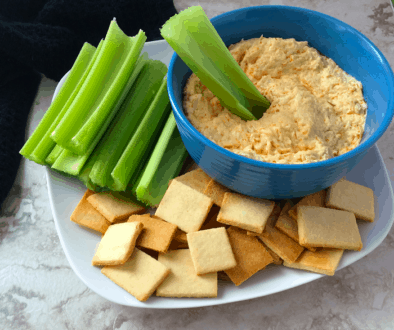 I wanted to make something that I can bring to family gatherings (or work potlucks) that would look great and taste even better, plus still be keto. 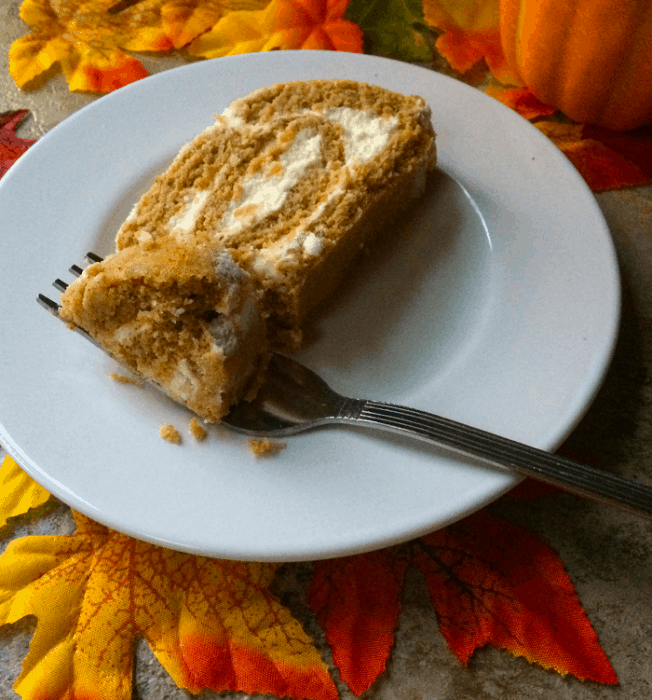 This cake tastes just like pumpkin pie in cake form because of the pumpkin and pumpkin pie spice in it. I love doing roll cakes because they are pretty easy, but they look like they are very hard to do. It is a little tricky to roll the cake and not have it crack. However, if it does crack just split the filling and put half in the cake and frost the cake with the other half. Problem solved, it will still look great and be just as delicious. This would make a great centerpiece for a Halloween or Thanksgiving get-together. It uses minimal pumpkin so it stays low on the carbs, but very high in taste. It will be a staple in my house for the holidays. This was one of those desserts that I just had to make keto friendly. I plan on making many different variations of this recipe in the coming months, just because it is visually a great dessert and so yummy. Try some of our other desserts such Keto Red Velvet Cake, Great Grandma’s Chocolate Meringue Pie, and Keto Half Moon Cookies just to name a few. 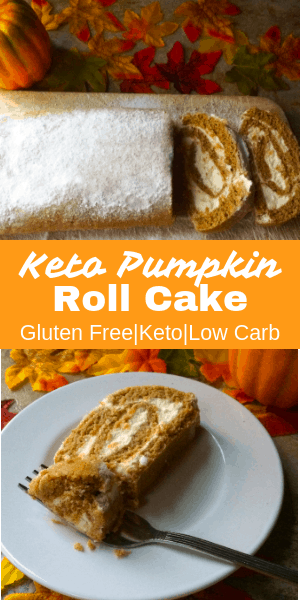 Nutrition for the recipe is on My Fitness Pal just search Certainlyketo-Keto Pumpkin Swiss Roll. In a medium bowl, mix together softened butter and powdered erythritol until well blended and smooth. Add pumpkin puree, eggs, and vanilla to butter mixture and blend well. In a separate bowl, add almond flour, protein powder, and baking powder. Mix together with a fork to blend. Add dry ingredients to wet ingredients and mix until well incorporated. Line a cookie sheet with parchment paper and spray parchment paper with cooking spray. Spread the cake batter across the entire cookie sheet evenly. Tap the cookie sheet on the counter a couple times to get out any bubbles and to even the batter out. Put it on the middle rack of the oven. Bake for 10-15 minutes. It will spring back a bit when touched and a toothpick comes out clean when inserted into the center of the cake. When cake is done, let cool for 5 – 10 minutes. After it has cooled for a few minutes, roll the cake with the parchment paper, starting from the short end. Try to make sure that the roll is tight as you roll. Leave on the counter to cool completely, at least 1 hour. Make the filling as the cake cools. Place softened butter and cream cheese in a medium bowl. Beat butter and cream cheese together until smooth. In another bowl, add heavy cream and beat until whipped cream. Add the whipped cream to the butter and cream cheese mixture. Add powdered erythritol and beat all together until smooth. After the cake has cooled and the filling is made, unroll the cake gently so that it does not crack. When completely unrolled, spread the filling over the whole cake, leaving a bit of space at the end without filling. 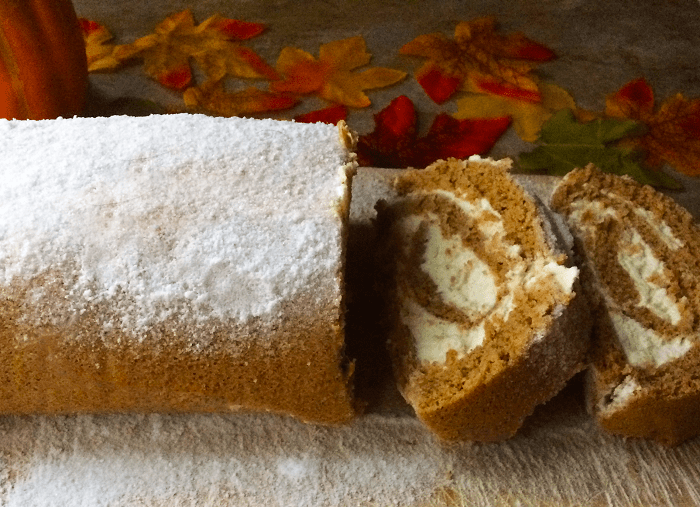 Roll the cake back up without the parchment paper. Make sure you keep it tight, but not too tight because the filling will spill out. Wrap it in plastic wrap. Place in the refrigerator for a couple hours to overnight to set. Garnish with a dusting of powdered erythritol (optional). We are participants in Amazon Services LLC Associates Program, we earn small fees by linking to Amazon.com and other affiliated sites. This in no way impacts the price of any item for the customer. Can you make this without the protein powder? Protein powder gives lift to keto baked goods. You could try using a bit more almond flour instead but I have not tried this and can not guarantee the results. 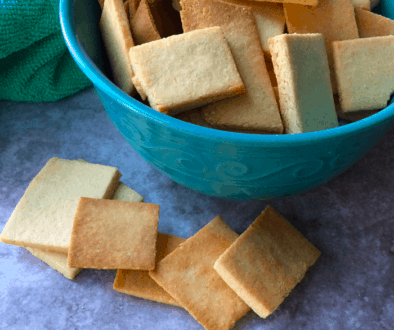 The batter should be like a cake batter consistency that you can easily spread out on the cookie sheet. Hope that helps. When rolling the cake, is the parchment paper to be rolled in between as well? Or just on the outside of the cake? Jessie, You could do it either way. I think you will get a tighter roll if you just use the parchment paper to guide the cake to roll but if it is easier for you to roll the parchment paper up in the cake then you could do that. You are going to unroll it anyway to add the filling so either is fine. We are participants in Amazon Services LLC Associates Program, we earn small fees by linking to Amazon.com and affiliated sites. This in no way impacts the price of any item for the customer.